This entry was posted in Haiku, Nature, Photography, Poetry and tagged Flowers, Haiku, nature, photography, Photos, poetry. You need a button that says ‘love’! Thank you, Mary. I’m so glad you loved it! 😉 I’m so loving my new DSLR! Thanks, Amy. The light was just right for this one! I think I’m getting better at that. Your comment means so much. I really enjoy your Haiku – you inspire me! Thanks, Carrie. The table is actually our breakfast room table. I designed it and did the mosaics several years ago. I liked the texture and color that came out in this photo. As always, thanks for your comment. Thank you, Jennifer. They had a very mild rose scent – they look like old fashioned roses, so I would have expected them to be stronger, but I really loved the color. Aesthetically, very pleasing! Ever consider doing magazine work? You might want to — and put that shot in your portfolio. Wow, V, thank you! Peter has been encouraging me to do some freelance work – either queried or stock photos. I did get a copy of Photographer’s Market and have started looking through it for possibilities. I so appreciate your feedback. I wouldn’t suggest it if I didn’t mean it. Your pictures rock Cathy. They are some of my favorites in the blogosphere, plus you always share an intriguing tale about their origin. Cathy — this GORGEOUS pic has two of my favorite colors — lavenders, plums, purples and that beautiful cool gray! Thanks, Brigitte. I hadn’t seen lavender roses in a long time. My bridal bouquet was lavender roses. This mosaic table is one that I designed and made several years ago. It’s our breakfast room table. I’m so glad you enjoyed it! I have never seen a lavender tea rose before! I didn’t even know they came in that color! Beautiful. I had never seen lavender tea roses either. I got them at Whole Foods in their floral department. 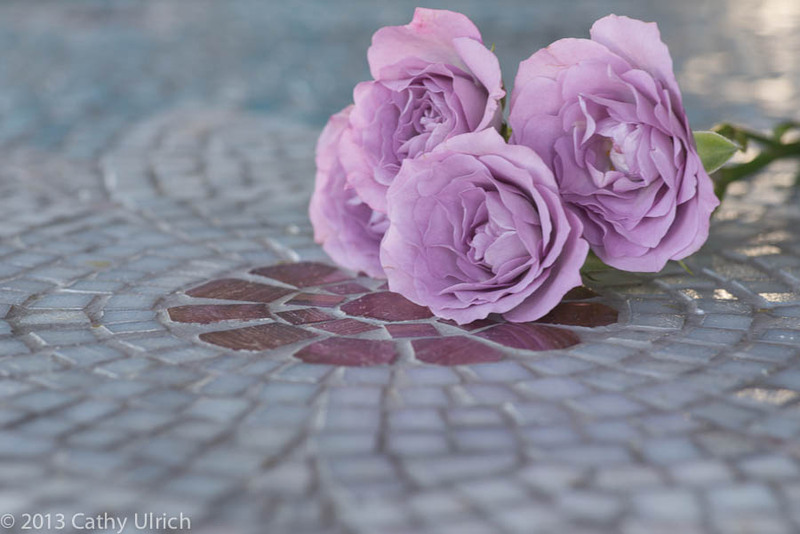 These little girls were so old fashioned and pretty, I thought they would look nice on our mosaic table. And the light coming from the upper right corner produced a nice reflection on the glass tesserae. I really had fun shooting this one. As always, thank you, Weebs. Thank you, Athena. I’m heading over there now! Your photograph is beautiful on so many levels, Cathy. The colors, textures, shapes, patterns, and feelings it evokes create a visual feast. Thank you for helping me to see this through your eyes, my friend. Thank you so much, Russ! It is surely my pleasure! Thank you for your thoughtful comment and support, my friend.